Presumption of innocence – There a lot of misquoted or misunderstood terms and policies with regards to criminal law that people usually get from watching television or seeing it on social media. Most of the time those assumptions are wrong, but every once in a while, there is a topic that people have the right idea about. One of those topics is the presumption of innocence. We have all heard that you are innocent until proven guilty; but what does that mean, where does that come from, and how is that handled by the court system? In this blog we will explore these things. What does it mean to be innocent until proven guilty? In regards to all criminal matters in the United States, when someone is accused of a crime, it is just that. It is an accusation. Charging someone of a crime is just a way to make that accusation formal, and subject the person to the court system. It is the responsibility of whatever government entity that is moving forward with these charges to prove those accusations beyond a reasonable doubt. Even if someone is charged with a serious crime, has made multiple court appearance and is sitting in jail, that person is by law innocent as long as his case is not resolved. Where does this presumption come from? 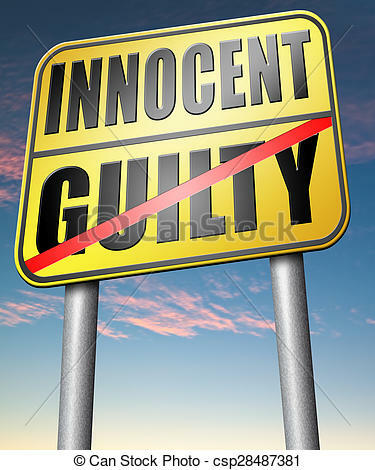 The United States Constitution does not contain the phrase “innocent until proven guilty” nor does it contain the term “presumption of innocence”. However, due the provisions regarding unlawful searches, self-incrimination, the right to a trial by jury, the right to counsel and several other laws protecting citizens accused of a crime, courts have found the presumption of innocence to exist from the very beginning of the country’s history. How is someone proven guilty? In order for a defendant to be found guilty in a court of law, he has to be found to have committed every element of the charged crime, beyond a reasonable doubt. This decision is made by the fact finder, which would be a judge in a bench trial or the jurors in a jury trial. In a jury trial, every single juror must find the defendant guilty of every element of the crime charged. If even one juror does not find him guilty, the defendant maintains his presumption of innocence. A defendant can also waive his presumption of innocence by admitting guilt as part of a plea bargain. If you have been charged with a crime, seek the help of a criminal defense lawyer. Contact us today.